Thursday, February 28, 2019 - 7:00 p.m. This speaking engagement is free and open to the public. ​Don't miss this rare opportunity to meet the John Burroughs Association as the Outstanding Published Natural History Essay of 2004 award winner. Mr. Kanze is an author, naturalist, guide, photographer, and videographer. 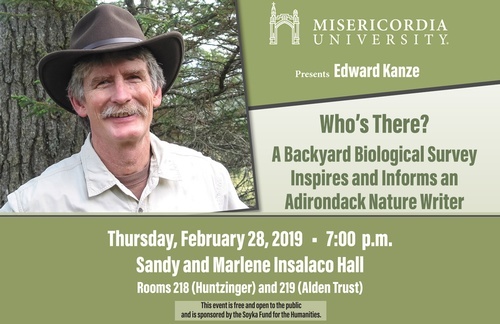 He is a nature writer and Adirondack guide who lives on the Saranac River in New York's six million acre Adirondack Park. This speaking engagement is free and open to the public. It is being sponsored by the Soyka Fund for the Humanities. See attached flyer for more information.